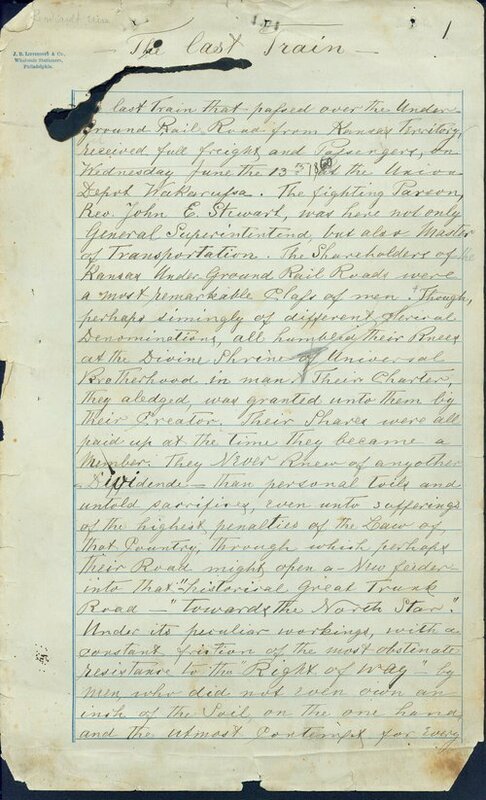 The Last Train is a forty-three page handwritten account (with additional notes interleaved with the original) of what is purported to be the last organized Underground Railroad (UGRR) journey through eastern Kansas in June of 1860. Charles Leonhardt, a participant, wrote the account in 1870. The Underground Railroad was a loose network of antislavery sympathizers who helped shuttle fugitive slaves from southern slaveholding states north to Canada. Fugitive slaves chose from several different routes through Kansas depending on their location within the territory.